Clear Computing provides discounted prices for various software including the featured software below. If you have any questions or would like to know more about any of the software we can provide, please contact us on 0333 344 8007. Clear Computing are a member of the Microsoft Refurbished PC program members offering additional value because they preinstall genuine Microsoft software, provide data wiping security services, and use environmentally sustainable best practices when refurbishing computers. Many refurbished PCs can run the Windows operating system. Windows is designed to make a PC simpler and daily tasks easier. With Windows and Windows Live Services, Microsoft Refurbisher program members offer a complete refurbished PC solution at a great value. Clear Computing is also a Microsoft Authorized Education Reseller (AER) program allows Clear Computing to sell Microsoft products at academic prices to qualified educational users. 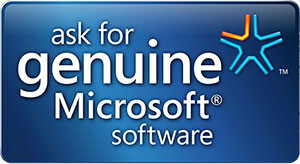 All resellers must be authorized to purchase and resell Microsoft products under Microsoft Volume Licensing programs.